Microscope, Binocular, Reasearch grade .Siedentopf 45 degree inclined head , 360 degree rotation. Widefield eyepiece 10x /18mm. Achromatic objectives, 4x 10x 40x (Spring), 100x (Spring) (oil). Built in coaxial mechanical stage.N.A. 1.25 Abbe condensor. Coaxial coarse and fine focusing. Iris Diaphram.LED illumination 20mA, 3.5v with intensity controls. 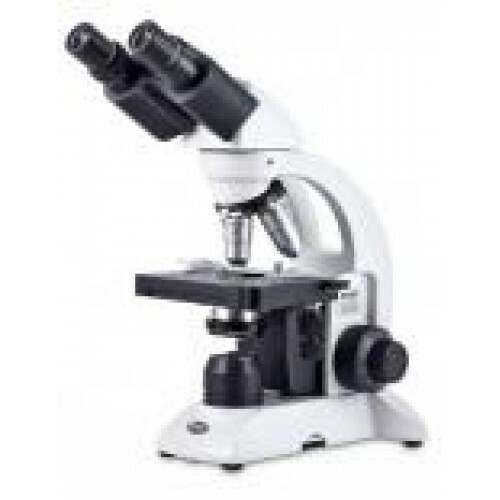 This microscope has a complete metal construction, precision mechanics, high quality optics which are made out of pure 100% glass and bright white LED illumination with intensity control.The nosepiece in reverse position permits easier changing and positioning of the specimen slides. All microscopes come with a 5 year warranty.